Thu, Mar 22, 2018, 11:11 pm SL Time, ColomboPage News Desk, Sri Lanka. 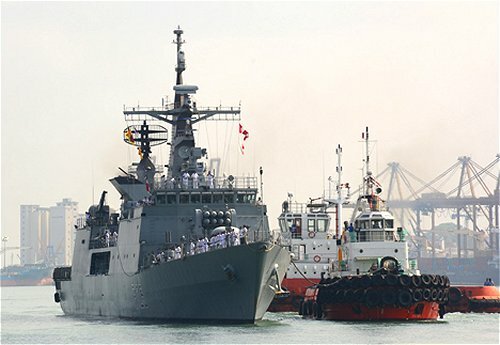 Mar 22, Colombo: Sri Lanka Navy, in accordance with naval traditions, welcomed a Bangladesh naval ship arrived at the Port of Colombo on Thursday (22 March). A guided missile frigate of the Bangladesh Navy, BNS Bangabandhu arrived at the port of Colombo on a four-day goodwill visit today, the Navy Media Unit said. During their stay in the country, the ship's crew will take part in several programs including friendly sports events, cultural events and sightseeing tours. The Commanding Officer of the ship, Captain Syed Shaif-ul lslam paid a courtesy call on the Commander Western Naval Area, Rear Admiral Nishantha Ulugetenne at the Western Naval Command Headquarters in Colombo. They held cordial discussions and exchanged mementos to mark the occasion. The event was also attended by the Defense Adviser of the High Commission of Bangladesh in Sri Lanka, Commodore Sayd Maksumul Hakeem. BNS Bangabandhu with a length of 103.7m and beam of 12.5m has a displacement of 2407 tons. The ship which comprises a crew of 233 is due to set sail from the port of Colombo on 25th of this month on completion of tour events.